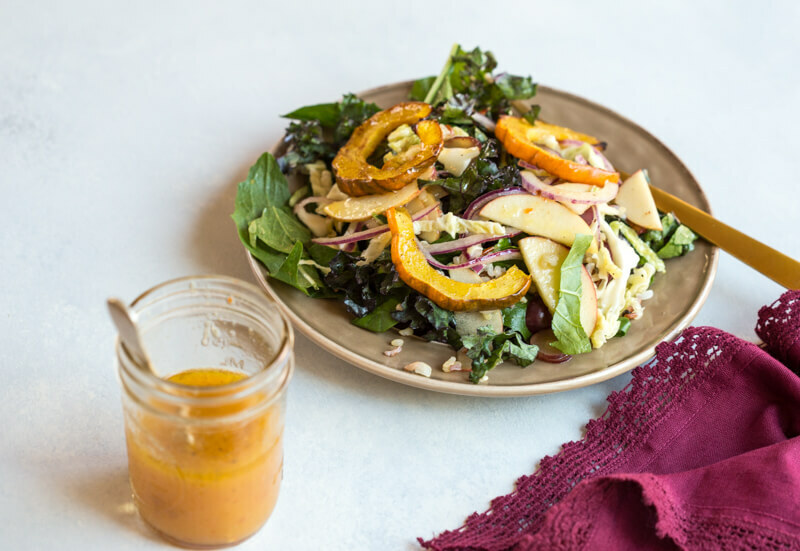 This Winter Greens Salad with Citrus Vinaigrette recipe is sponsored by Juice Products Association and the Healthy Aperture Blogger Network. YES YES YES!!! 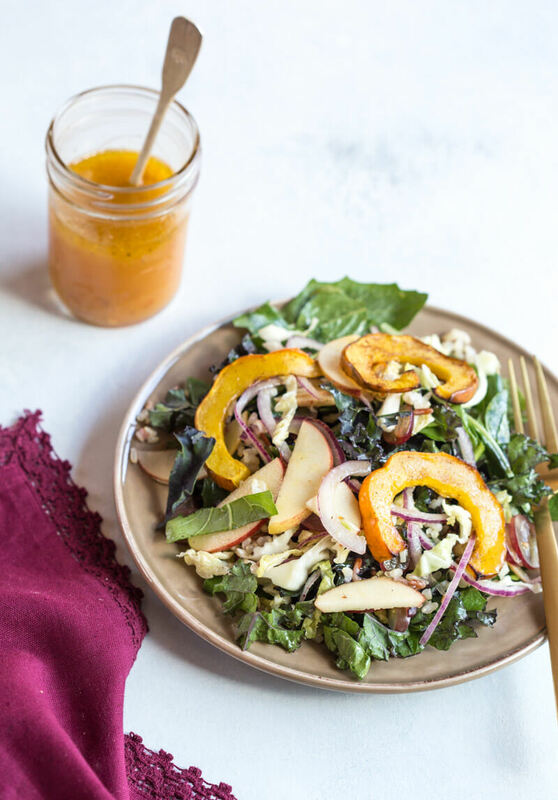 I’m all about this Winter Greens Salad with Citrus Vinaigrette and it’s exactly what you need on your holiday table. I love getting in a bowl full of green goodness all the time, but especially around the holidays when we are bombarded with sweets. This salad bowl is so nourishing and hearty thanks to the winter greens and hearty grains. They fill you up and make you feel so freaking awesome eating it. That can’t-stop-won’t-stop-all-day-errr-day energy that we most definitely NEED for all the holiday shopping and getting the house ready for friends and family to visit. 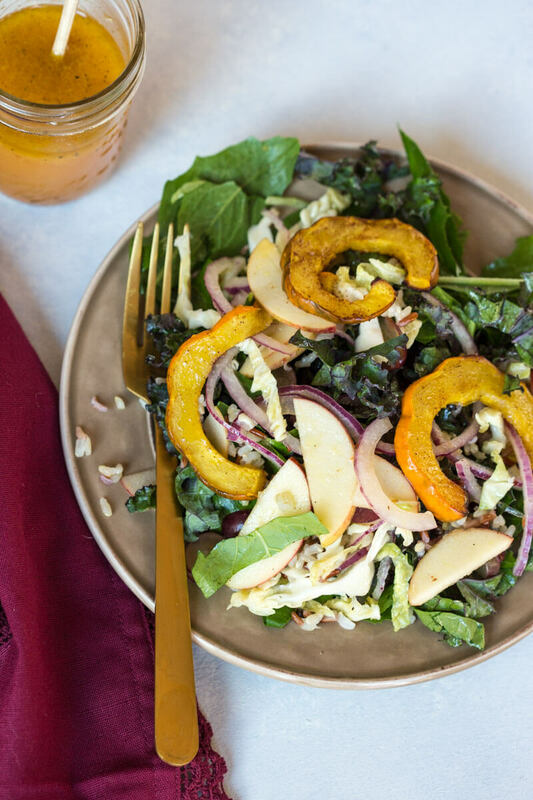 This Winter Greens Salad with Citrus Vinaigrette has all the good stuff in it. WINNING! Add grilled chicken or garbanzo beans to make this salad a meal, or serve it alongside your holiday spread. 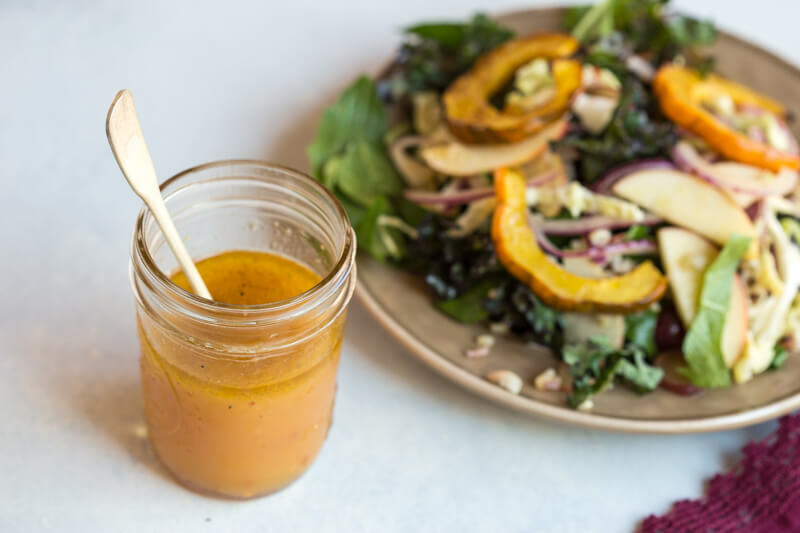 This Tangy Citrus Vinaigrette is made with 100% orange juice! 100% juice is filled with the same important vitamins and nutrients as the whole fruit it is squeezed from and made with no added sugar. And since 80% of Americans (yes, that’s pretty much everyone) do not eat the recommended amount of fruit and vegetables in their diet, juice can be an easy way to increase your intake! If you have kiddos, the Academy of Pediatrics suggests serving sizes of 4 ounces for young kids 1-6 and 8 ounces for older children ages 7+. This Winter Greens Salad with Citrus Vinaigrette tho. 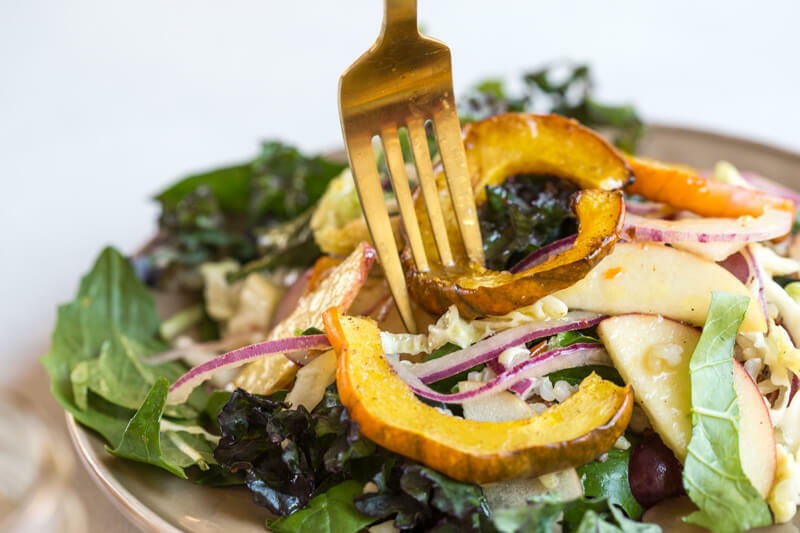 It’s exactly what should be on your holiday table— warm acorn squash, apple slaw, winter greens, hearty grains and a tangy citrus vinaigrette! Add grilled chicken or garbanzo beans to make this salad a meal, or serve as a salad in your holiday spread. Slice acorn squash in half lengthwise, scoop out seeds and thinly slice the squash. Arrange squash on baking sheet and toss with coconut oil and cinnamon. Bake for 15-20 minutes until golden and skins are soft. 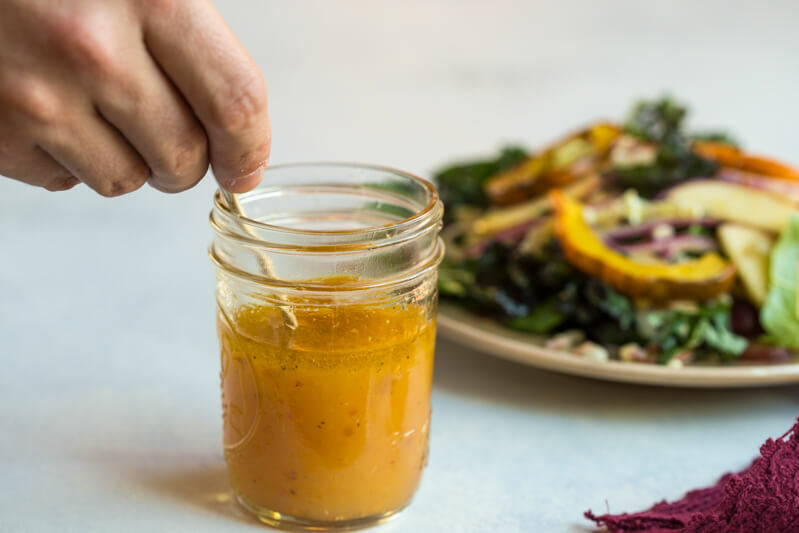 In small bowl or mason jar prepare Citrus Vinaigrette. Whisk together orange juice, apple cider vinegar, chili garlic sauce, olive oil, and maple syrup. Season with salt to taste. In medium bowl, toss together apple, onion, cabbage, grapes, and 2-3 tablespoons of dressing. Prepare salad by tossing mixed greens with salad dressing. Top with hearty grains, apple slaw and acorn squash. What a lovely salad! Squash, apples, cabbage… I am in love. Seriously. Making it next week! Mmmmm what a lovely salad for this time of year! I should be eating more salads, but I’m all about the carbs right now. Need to get into gear and start eating more healthily again! I love everything about this. And I could TOTALLY use some extra veggies right now. Pinning to try!